NEW DELHI – As many as 160 people were feared dead after an Air India plane arriving from Dubai crashed and burst into flames at dawn Saturday as it overshot a hilltop runway in southern India while trying to land in the rain. Television images showed dense black smoke billowing from the Boeing 737-800 aircraft surrounded by flames just outside the Mangalore city airport in a hilly area with thick grass and trees. Firefighters sprayed water on the plane as rescue workers struggled to find survivors. One firefighter ran up a hill with an injured child in his arms. Air India official Jitender Bhargava the plane carried 160 passengers and six crew members. Officials in the state of Karnataka said only six or seven might have survived. 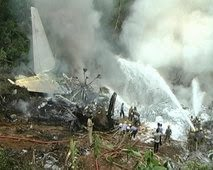 Prime Minister Manmohan Singh expressed condolences for the crash and promised compensation for the families of the victims. As the plane tried to land about 6 a.m. Saturday, it overshot the runway and crashed, Bhargava told The Associated Press. Scores of villagers scrambled over the hilly terrain to reach the wreckage, and began aiding in the rescue operation. Pre-monsoon rains over the past two days caused low visibility in the area, officials said. The airport's location, on a plateau surrounded by hills, made it difficult for the firefighters to reach the scene Saturday, officials said. Aviation experts said Bajpe airport's "tabletop" runway, which ends in a valley, makes a bad crash inevitable if a plane overshoots it. Mangalore airport is about 19 miles (30 kilometers) outside of Mangalore city.